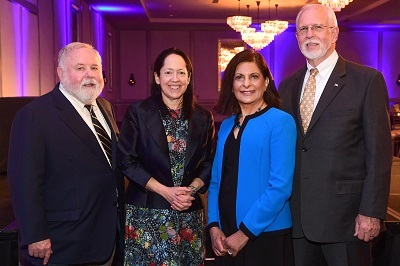 Award recipients (left to right): Jonas “Jack” Shulman, Barbara Stoll, Gulshan Harjee, Thomas N. McNish. On May 3, Emory medical students welcomed alumni, donors, faculty and friends to a reception during which named scholarship recipients had the unique opportunity to meet and connect with donors, followed by an awards ceremony celebrating the lifetime achievements of some of Emory School of Medicine’s most distinguished alumni. Lisa Drake, MD, 93M, co-chair of the School of Medicine Alumni Board’s Development Committee, provided a welcome at the reception and spoke briefly on the importance of philanthropy, noting its significance in driving the innovation and collaboration that makes Emory a world-class academic medical center. Drake recognized the contributions of the Wise Heart Society donors, a group of alumni who play a crucial role in accelerating discoveries made by School of Medicine faculty members through ongoing, leadership-level investments in Emory. “Endowed funds support professorships, fellowships, and lectureship programs that give researchers and faculty room to expand discovery and enhance patient care,” said Drake. “Generous gifts from our donors and alumni to support scholarships and programming allow current medical students to enjoy the same great opportunities we all had.” She noted that in fiscal year 2017, alumni gifts and commitments totaled more than $11.2 million. Following the reception, Anna Kuo, MD, president of the Emory Medical Alumni Board, a 1989 graduate of the School of Medicine, and proud parent of an Emory medical student, kicked off an awards ceremony to honor four alumni who have made extraordinary contributions to their profession, to their communities, and to Emory. After acknowledging past award recipients, Kuo introduced Vikas Sukhatme, MD, ScD, dean of the School of Medicine. Reflecting on his first five months as dean, Sukhatme shared a few attributes he’s found most inspiring about the school—including the collaborative environment, the depth of intellectual talent and passion of our people, and finally, the enormous support from the community. Sukhatme — noting his affinity for numbers — shared statistics that represent the rich history and broad reach of our medical training program, including the more than 6,000 living graduates of Emory’s medical program and more than 11,000 former residents and fellows practicing around the world. Emory-trained physicians practice in all 50 states and in 110 of Georgia’s counties. Kuo then introduced Bill Eley, MD, executive associate dean of education, to share a brief update on the state of the School of Medicine. According to Eley, “more than 9,400 applications were received for 138 spots in our medical school class—an incredible statement of who we are, who we serve, and the people we already have here at Emory.” Eley emphasized the importance of continuing to expose incoming students to the knowledge and guidance of leaders like those being honored in this event, and to share with them the amazing gift of being able to work in the service of others. Henry Blumberg presented the Distinguished Medical Achievement Award to Jonas “Jack” Shulman, MD, retired professor of Medicine and former head of the Division of Infectious Diseases in the Department of Medicine. Ralph Haynes presented the Arnall Patz Lifetime Achievement Award to Thomas N. McNish, MD, 78M, board chair of Biodynamic Corporation in San Antonio, Texas, where he serves as a consultant in biomechanics, impact analysis and injury causation analysis. Tanveer Rab presented the Distinction in Community Service Award to Gulshan Harjee, MD, 82M, 85MR, for her dedication to providing medical care to underserved communities. She is a co-founder of the Clarkston Community Health Center, a nonprofit that provides comprehensive health care to the disadvantaged community in Clarkston, Georgia. Susie Buchter presented the Emory School of Medicine Award of Honor to Barbara Stoll, MD, 79MR, the H. Wayne Hightower Distinguished Professor in the Medical Sciences and dean of the University of Texas McGovern Medical School.